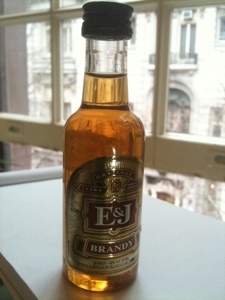 The Coopered Tot: E&J Brandy - US domestic price per volume leader. Last week I put E&J VSOP in the anchor spot in my overview of midrange Cognacs (and brandy: any grape distillate not from the controlled region around Cognac, France is "brandy"). I hated it, one starred it, and literally poured it down the drain. It had a bad fake orange flavor like cough syrup. I have to own that it may have been a bad sample - but even if it isn't I must ask "is this a legitimate representative of cheap domestic grape brandy?" I remember that, growing up there was always a large flagon of plain brown label E&J, either the oblate half gallon or the more utilitarian shaped gallon (that looked suitable to mount on the back of a Jeep to either revive you from chill or get you to a gas station in a pinch) next to the gallon of vodka and a fifth of bourbon or scotch. Why? I suspect the value proposition had something to do with it. E&J plain currently goes for the princely sum of $8.99 / 750ml. It's the cheapest barrel aged hooch at Shopper's Vineyard - and that's saying something. I don't think my parents, children of the Depression that they were, could overlook that kind of value. I'm not sure I can either. Surely it couldn't have been that bad if gallons came and went. I seem to recall most of it was consumed neat. Surely I owe that once favored snort a proper try. Nose: white raisins and dry white wine (Sauvignon Blanc) and a hint of oak. Not bad. Entry is moderately sweet with some jammy vinous sugars. Midpalate has moderate spirit heat but almost no turpentine nastiness at all. It's actually pretty smooth. The dominant flavor notes at midpalate are a somewhat a muted but credible cognac flavor profile of orange citrus preserve, grape spirit, and some nice sawn oak. The mouth feel is thin - but not unpleasantly so. The finish is relatively short and pretty tidy. There's a trace of bitterness, but nothing too annoying. Knock me over with a feather - this is pretty drinkable. I bet they sell a metric TON of this stuff. Bottom line, it's an off dry presentation with fairly thin mouthfeel and a tiny bit more spirit heat than would be ideal for the grantedly muted flavor density. But the flavors that are present are not bad. It's not a gourmet experience, but it's fine to drink neat and mixes fine. This is way WAY nicer to drink than grainy cheap scotch, Irish, or Canadian. I put in the same league as cheap bourbon (like Evan Williams White) - i.e. a bargain. Two stars on taste alone, but for the money it's an unassailable decision - even recommendable. How does it compare with the Courvoisier and Hennesy VS experessions? The wood in the E&J is more muted - less exuberant and patchouli incensed. The E&J is a bit drier too - but on the whole feels generally comparable for 1/3rd the price. If I said that I didn't get hammered on E&J when I was 18 I would be lying. However Jack Daniels was the preferred vehicle to the land of swoon back then. I think the "tough man" aura was the main reason. In terms of drinking pleasure they are in the same region and these days I'd probably pick the E&J. That being said, I have open bottles of top drawer Cognac in the house. E&J is a niche player for me now: big parties - particularly big bowls of brandy punch, French 75, sangria etc... E&J have the flavor to come off as classy but is priced on totally right for situations where you need quarts of booze without pulling a budgetary muscle. I wouldn't pour this for (non-epicurian) guests for sipping neat (even though it wouldn't offend). I'd be more likely to whip out Remy VSOP or Frapin VSOP (or, of course, good Scotch or bourbon). If you want a good mixing brandy, Jaques Cardin VSOP is the way to go. Up here in control state Oregon it's only $12 a bottle, but it makes a totally solid Sidecar. Pretty decent vanilla and oak, with a decent amount of fruit to balance that. One of those cases where the BTI was spot on. I'd be curious what their XO bottling is like. The BTI gives it a pretty good score, but they're not perfect. More time in wood might give more complexity, but it also might just turn into oak extract given that they probably don't have tip-top barrel management. If ANY of that is true it would press the "reset" button on the whole value equation (if you like to drink brandy, that is). Could it be the Elijah Craig 12 of the grape liquor world? (at more than 25% cheaper than that bargain epicure king). Clearly a full review is in order. I'll put it on my shopping list. I mean for fifteen bucks, what's the downside? I am pretty curious. One of these days I'll have to pick up a mini of some Cognac/Brandy. There's a few decent ones in the stores here (Remy Martin, etc). Cognac is a very different flavor profile. Remy VSOP is a great introduction. It's like the Johnny Walker Black of Cognac (middle of the road quality, heart of the flavor profile, real world pricing).